Bicycling has only recently become a serious planning consideration, and the vast majority of American city streets remain intimidating places for cyclists, despite their growing numbers. 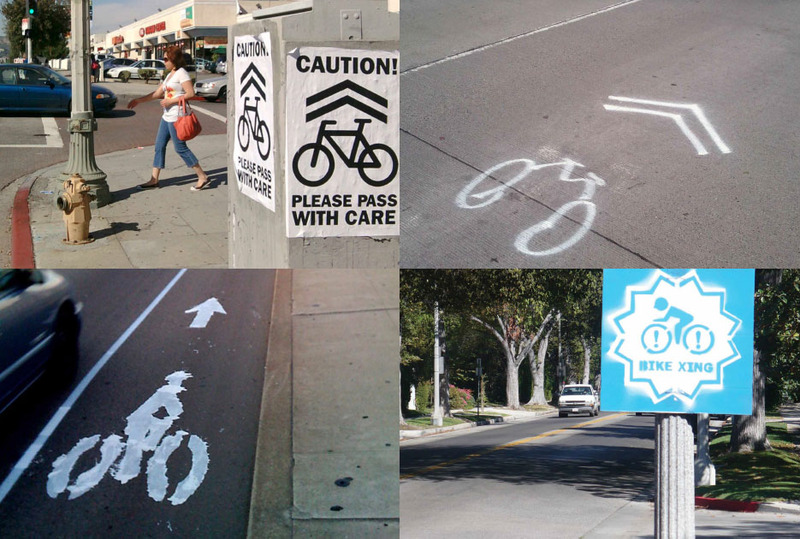 With city planners moving slowly to adapt, cycling advocates are taking matters into their own hands, painting bike lanes, share-the-lane “sharrows,” and other signage, often under cover of night. Many guerrilla bike lane painters point to Toronto’s Urban Repair Squad as the pioneers of the practice, but some of the most voracious adherents can be found in Los Angeles, including an anonymous group of activists working under the aegis of the Department of D.I.Y. Do-it-yourselfers have also installed bike route signs, “pass with care” posters, and even “softened” unfriendly square curbs with blobs of concrete.